It is one day past a month since mum died. I went through my photos today to find the last photo that I took of her. Aptly it was on Mother's Day & when I stop & think about it, it really wasn't too many months before her death. 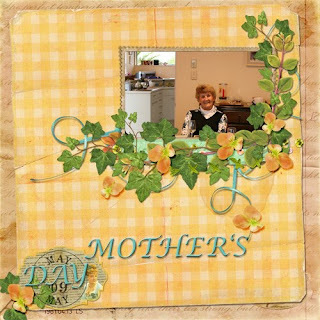 I found a beautiful quickpage from Raspberry Road Designs that I thought was perfect for mum. Funnily enough the quick page came from the Tea for Two kit, mum was always a tea drinker & on Mondays her sister & her would sit down & have tea for the two of them & discuss their lives.